Ideal for enhancing pathways and entrances or as a stunning standalone feature. It has a stylish pergola style roof and diamond-design trellis side panels that are ideal for climbing plants. 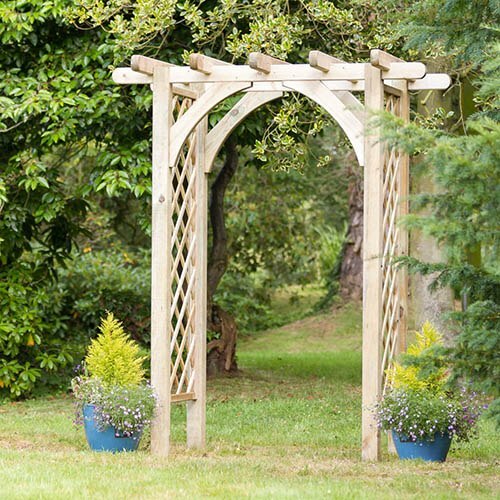 The arch has an adjustable width of up to 1.8m, allowing you to adapt the piece to suit any garden size or arrangement. Made from FSC Certified, pressure treated timber, it comes with a 10 year guarantee against rot for extra peace of mind. Add instant height to your garden with the stunning 2.20m tall Horizon Arch. A feature piece on its own framing pathways and walkways in the garden, it's also an ideal support for climbing plants which will smother the rustic timber in blooms for a wonderful floral display. The Horizon Arch has an adjustable width of up to 1.8m, so can suit most garden shapes and sizes and is made from FSC Certified, pressure treated timber, coming complete with a 10 year guarantee against rot. Includes 9cm square posts, straight roof and 2 side trellis panels. Made from FSC Certified pressure treated timber - comes with 10 year guarantee against rot.